A flurry of recent articles brings home yet one more way that technology is changing education: In districts across the country, snow days—those giddily unexpected days off—are becoming relics of the past. Beginning on December 1, for example, the schools around Camden, Maine, will replace two snow days per year with so-called Remote School Days, when students will complete coursework at home using internet-connected devices. Given that many employers around the country have been implementing work from home policies in recent years, it was probably inevitable that the idea would spread to schools. And for schools, there’s the logic of the initial investment: If they’ve spent money acquiring devices for every student, as many have done, there’s a strong argument to be made that they should maximize the utility of those devices—part of the rationale for buying them is to expand students’ opportunities for learning. Still, snow days have history—and nostalgia—on their side, so why the growing consensus around replacing them? The answer largely comes down to the complex demands of school scheduling and concerns about the effects of disruption on learning. In the winter of 2016–17, for example, schools around Portland, Oregon, lost nine days of school in December and January—enough that between snow days and the planned holiday break, students attended school on just 11 out of 30 weekdays in one stretch. All that snow—some Oregon schools lost 14 days—was later considered a factor in students’ poor showing in reading, writing, and math on state-mandated tests in the spring. A series of storms will have cascading effects on school systems. Principals and district leaders have to rework the calendar for the rest of the year—deciding whether to bring teachers and students back and shorten spring break, or keep them both longer and extend the end of the year. Both of those options can wreak havoc on family travel plans—plane tickets and hotel reservations are sometimes not refundable, and high school juniors and seniors often use spring break to visit colleges, for example. 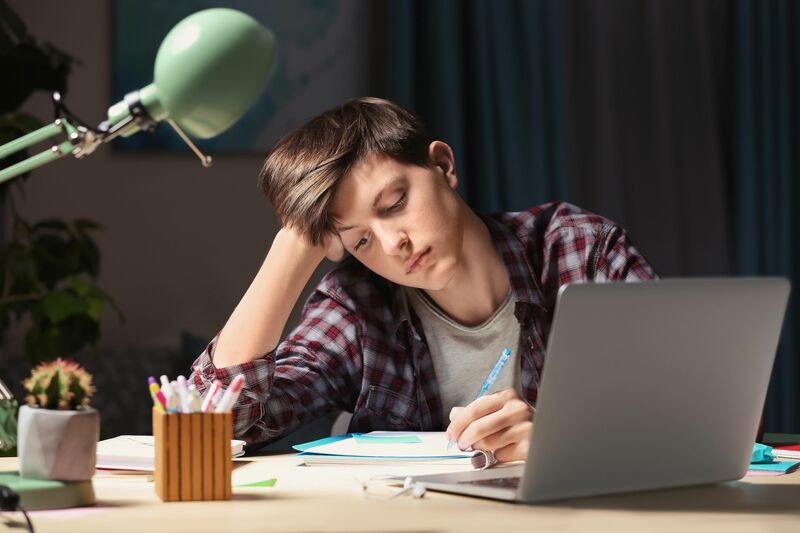 Having students do school work at home on snow days eases the problems administrators face, but not the parents’ need to sort out child care or take a day off themselves. And there’s a more serious issue that distance learning can’t fix: About 20 million children receive free lunch at school, and 11.7 million receive free breakfast. Maine is following the lead of school districts in Illinois, Indiana, Minnesota, New Hampshire, Ohio, Pennsylvania, and other states, which began experimenting with working through snow days a couple of years ago. Over the summer, Anderson County School District 5 in South Carolina announced that students would work online on the school’s Chromebooks in the event of snow, and four other South Carolina districts quickly followed. Schools and districts that are trying to figure out how school at home works can take a look at the example of St. Mary’s Academy in Portland, Oregon. Responding to the 2016–17 winter, the school set up procedures for Digital Learning Days after hitting four snow days before Christmas. Alyssa Tormala and Ellie Gilbert described the school’s procedures for Edutopia. Implementation isn’t always easy. One of the issues schools face is that not every student has internet access at home. The Camden, Maine, district is trying to address this with Kajeet SmartSpot devices, which enable students who have cellular service to create a Wi-Fi hotspot. Some schools try to send students home with the work already loaded on their devices, when possible. (Younger students—those in grades pre-K to 2 or 3—generally bring home folders or bags filled with worksheets, learning games, and reading logs to track daily choice reading.) And students’ work is generally not due the day they return to school. In Marblehead, Massachusetts, for example, the district is proposing that work be due a week after the last day off, to enable students who need help to get it from their teacher. Not every state is rushing to join the trend. Students in Rhode Island, for example, can breathe easy: The state passed a law in 2017 designed to allow schools to plan virtual work days, but the first district to submit a proposal, North Smithfield, has rescinded that proposal, citing insufficient guidance from the state Department of Education.